Although related to the elves, the drow are a vile and evil cousin at best. Sometimes called dark elves, these cunning creatures prowl the caves and tunnels of the world below, ruling vast subterranean cities through fear and might. Worshiping demons and enslaving most races they encounter, the drow are among the underworld’s most feared and hated denizens. Drow are shorter and a bit more slender than their surface-dwelling kin, but they are otherwise physically similar. 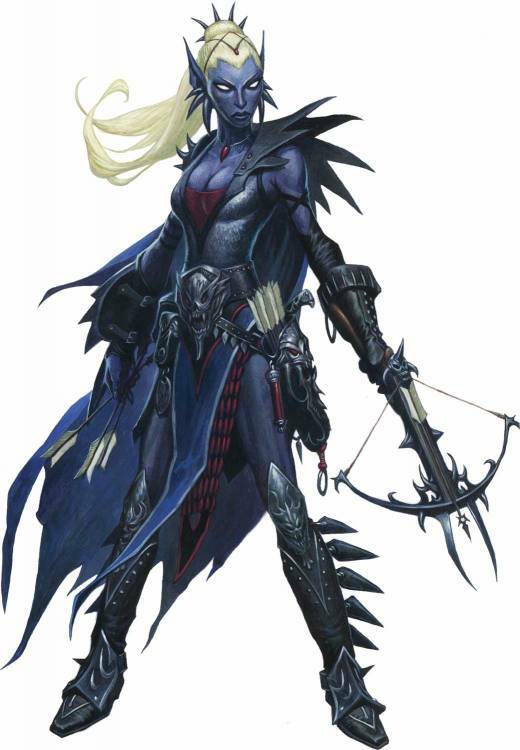 Drow have dark skin, ranging from black to a hazy purple hue. Most drow have white or silver hair and white or red eyes, but other colors are not unheard of. Drow society is ruled over by powerful nobility, themselves governed by sadistic and dangerous matriarchs who constantly plot and scheme against rival houses and lesser kin within their own families. The majority of drow are the common soldiers and decadent citizenry. Medium: Drow are Medium creatures, and have no bonuses or penalties due to their size. Drow Immunities: Drow are immune to magic sleep effects and get a +2 racial bonus to saves against enchantment spells. Keen Senses: Drow receive a +2 racial bonus on Perception checks. Languages: Drow begin play speaking Elven and Undercommon. Drow with high Intelligence can choose bonus languages from the following: Abyssal, Aklo, Aquan, Common, Draconic, Drow Sign Language, Gnome, or Goblin.